City of Rockingham, one of the southern suburbs of Western Australia and the mainly the area of local Government. Our Car Wreckers Rockingham 6168 crew buy and remove old cars, trucks, Utes, vans, SUVs, and 4×4’s for highest cash in Rockingham and offer the fast removal service same day. When you start sensing that your vehicle has reached the end point of its life. 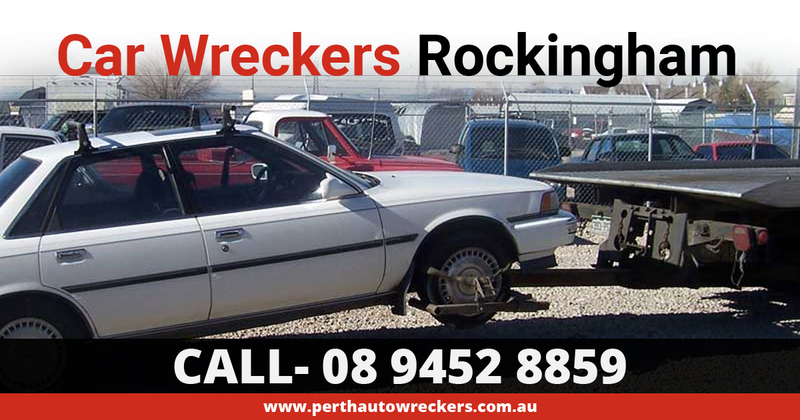 It’s time to contact the extremely professional and outstanding “PerthAutoWreckers”. Our experience in cash for cars business is so wide that we can help you sell your car with no troubles. With our help you can get a very flexible, quick and smooth vehicle towing service in Rockingham, Perth. This is true no matter what condition you want to sell your used ride. We don’t make any unreasonable agreements because of a bad condition of the automobile. We take care to give a genuine price that is hard to beat. Need a cheap parts in Rockingham? We can find it for you. Just give us a call and one of our team members will find it for you. We sell used recycled car body parts and accessories at fairly smashed prices. So why are Perth Auto Wreckers in Rockingham your best option? Well-certified, insured and bonded to do the auto removal process in an eco-friendly manner. Super-efficient in giving FREE auto wrecking everywhere in Perth including the city of Rockingham. Providing same day scrap car pickup facility to most areas of Perth. Fuss-free and quick transaction process. Take care to organise the required documents for legitimate sale of the vehicle. Take every design and condition of the vehicle for the highest dollars up to $5’999. A reliable and professional team of vehicle removers available 24 hours and 7 days in a week. We buy all brands and we are proud of that. We are specialised in providing a great amount of money for both old and broken cars in Perth. However, if you have trucks, SUVs, 4WDs, vans or Utes which are not repairable. You can still expect to receive fair dollars for it. We guarantee to offer top cash amount for Honda, Suzuki, Mazda, Kia, Jeep, Holden, Nissan, BMW, Ford, Toyota, Audi, Hyundai, Subaru, Isuzu and other major models. We help people living in all regions of Perth by taking off their rusty and unwanted wheels. We can pick-up and remove it from your desired place in Perth. It is because we own top notch resources, skills and equipment to appropriately deal with every junk ride. We take necessary precaution to avoid any accident that can damage the vehicle. After the required paperwork is completed, we pay full cash to customer and then only take off the automobile. We are in a habit of collecting vehicles on the same day when customers contact us. Not just this we never delay in paying the assured cash. You don’t have to take much stress about gathering the documents required to complete the sale process. Just let our team do it on your behalf. You have to do just one simple thing and that is contacting us. Call us, if you want, our friendly team will be happy to give you an online car valuation for free. You have to just visit our home page and fill out the inquiry form given on the right side. Often vehicle dismantling process appears to be a very tedious job. But with our team it becomes a really simple and easy process. As we can remove your piece of junk from your home be it in any part of Rockingham 6168. This is topped with the good news that there are no fees or hidden expenses related to vehicle removal. You can contact our team today to request an appointment.